I have spent relatively little time--almost none, actually--in true college towns. I've spent a fair amount of time in Austin, a fun city and home to the University of Texas, of course, but there's much more to Austin than just UT. Mercifully, I've never been to College Station, and I went to school in Fort Worth, which is far from being a college town. So, maybe that's why I've been so impressed with the passion for Kansas State here in Manhattan, Kansas. 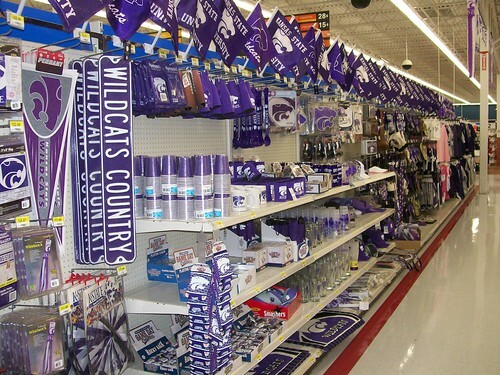 The Power Cat logo is everywhere here, and locals wear K-State gear even in the middle of a broiling Midwestern summer. There's more to Manhattan than K-State--but not much more. The school largely dominates life here and swells the population of a small city (population 45,000 or so, I think) by 20,000 when the kids are in town. Manhattan's a nice place. Because it's a college town, there are plenty of bars and restaurants, and there's probably more to downtown (and the unfortunately named "Aggieville," where the college kids hang out when they're in town) than there would be in a city this size that lacked a major university. It's also at the edge of the Konza Prairie, one of America's great wonders and a place that should attract hundreds of thousands of tourists every year but doesn't, in part because Kansas invests so little in promoting tourism. I have no regrets about having attended TCU in Fort Worth, but being here in Manhattan, I do wonder what college life in a real college town--where my fellow students and I would have been the center of attention and the town would have largely revolved around us--would have been like. It might have been fun; it might have been oppressive--it would likely have been a bit of both. I'll never know, of course. And that's fine with me.